While most people owned refrigerators in the 1940's we were not an exception. But our freezer compartment was just for ice cubes nothing else. A refrigerator with a freezer compartment for ice cream and frozen food was yet to b developed. My mother like most shopped every day. That was the one way of controlling spoilage. Some meat could be kept for a while like bacon, ham and others. But chicken had a mind of its own. Chicken would flip very easy. 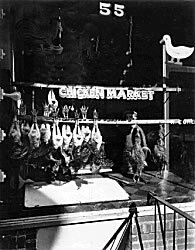 That is why we had chicken markets. We had one on Hallstead Street near Tremont Avenue and there were also several Down Neck . I think I went to one on Lafayette Street in the 1960's. They were selling squab (pigeon). That satisfied my need as an amateur taxidermist for cadaver. In the 1970's I thought I would give a couple of my daughters a taste of the past. We went to the Hallstead Street Chicken Market for a chicken. They picked a chicken from one of the many cages. They watched in amazement the automatic decapitation and plucking process. This was complimented by the butcher cutting it up in quarters. It was then wrapped in wax paper and placed in a brown bag. As we left the store and headed toward my car I gave the bag to one of them. She only held the warm bag for a few moments. The other daughter didn't do much better. Neither one of them ate chicken that night.